For generations, women have been repositories of society’s deepest secrets. Even in his recording of folktales across the length and breadth of India, A.K. Ramanujan often noted that it was the women who had assumed the responsibility of telling, retelling and thereby, passing down stories to their succeeding generations. In a sense, women became responsible for preserving their society’s cultural memory. In holding this power, however, they also began to shape this memory. Born in societies which often silenced women, stories became a tool to articulate shared experiences, caution other women, and pass on advice on matters which could not be openly discussed. In this way, stories also acquired an important role in the upbringing of children. 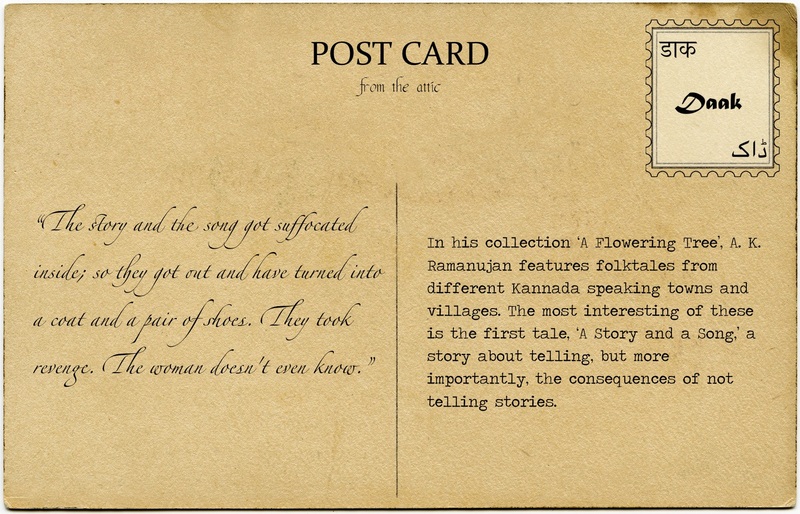 In his collection ‘A Flowering Tree’, Ramanujan features folktales from different Kannada speaking towns and villages. The most interesting of these is the first tale, ‘A Story and a Song,’ a story about telling, but more importantly, the consequences of not telling stories. A story and song take root inside a woman’s body but she does not give them voice. As a result, the story and song transform into material objects which wreak havoc on her marriage. These strange objects which appear out of nowhere draw her husband’s attention and suspicion. On getting no answers from his wife, he is convinced of her infidelity and goes to a nearby temple to spend the night. It is only when all the “lamp flames” of the town meet at the temple to gossip about the day’s events that the husband learns of his wife’s innocence and the revenge of the untold story and song. This simple and happy ending, however, does not quite mask the lingering discomfort caused by the knowledge that untold stories find a way to escape and take revenge upon the person who engenders them. You can find the entire collection of ‘A Flowering Tree’ here.